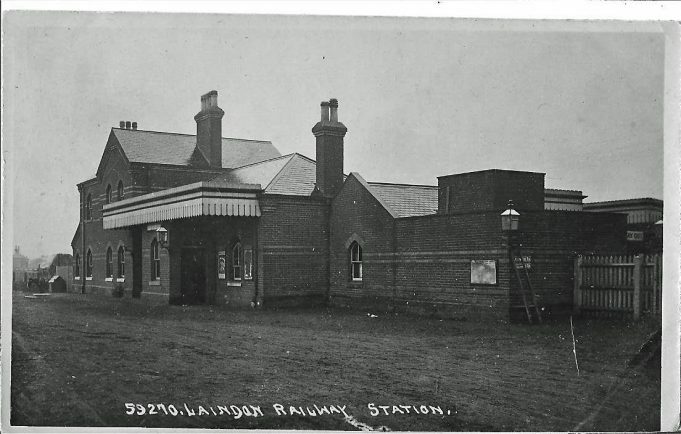 Laindon railway station came into service in June 1888. Prior to its opening Laindon and the surrounding district was as remote as any area in Southern England despite its closeness to London . With the agricultural depression of the 1870/80s and the coming of the railway this made the area ripe for development in the latter part of the 1800s. To house the railway workers, a row of eight terrace cottages were built at the west end of the railway station off Denbigh Road backing onto the railway line. They became known as the ‘Railway Cottages’ and were not demolished until the early 1970s. By 1912 the London, Tilbury and Southend Railway Company (LT&SR) had been absorbed by the Midland Railway (MR), with further amalgamation in 1923 to the London , Midland and Scottish Railway ( LMS ). The train service is now operated by the company C2C. In 1933 the up platform was made into an island and a third line added to provide a passing loop for up trains to Fenchurch Street . In 1957 this loop became the main up stop and the previous stop reversed. Laindon, like a number of stations had an engine named after it. It was a 4-4-2 tank, built in January 1885 and given the number 23. It had a new or repaired boiler in 1896 and when the MR took over in 1912 it was renumbered 2132. In 1922 it was given another boiler, renumbered by LMS in 1927 (2197) and again in 1929 (2074). It was finally withdrawn from service in December 1930. Probably the most famous station master was John Harry Sims but this was because of his daughter, Joan Sims who was born in 1930 and was destined to become a famous actress. In her autobiography ‘High Spirits’ she tells us that Laindon station offered her a ready made stage where in the loading bays of the goods yards that faced directly towards the platform she would dress up and put on impromptu performances for the stream of passengers. ‘Laindon station was a world of its own, rich in characters’. Though Laindon was not in the front line in the Second World War it did see a considerable amount of enemy action, partly bought on by the fact that German aircraft would use the railway, as it had done in the First World War, as guidance into the centre of London . An anti-aircraft gun was therefore installed in the station goods yard. The goods yard was roughly where today’s main station car park is and in its early days was used by various coal merchants. Hall’s, Hayes Fuels and Morris and Farmer all had a coal depot there. The Evening Standard and Newspaper group also had a small building in the yard. The latter part of the 1950’s saw some station improvements, upgrading the tobacco kiosk and a personal weighing machine. Joan tells us that her Aunt served in the sweet and tobacco kiosk, making the running of the station a family affair. Then in 1961 came electrification, almost 50 years after it was first proposed. In June 1962 the last steam train the 42501 left Fenchurch Street Station at 6:10pm for Thorpe Bay. Other than a special clean and polish for the occasion there was no other celebration and she ended up in Shoeburyness depot, awaiting the indignity of the breakers yard. 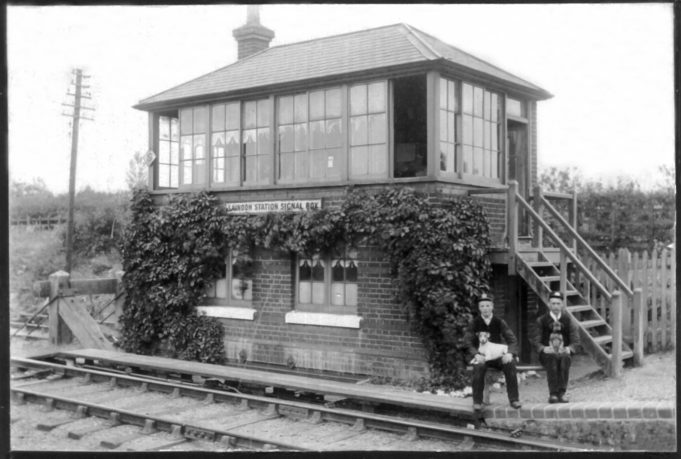 The signal box at the east end of Laindon station then soon disappeared. The 18th June 1962 saw the full electric service commence and although the journey from Laindon to Fenchurch Street was cut considerably from 50 minutes to 35 minutes, it became known as the ‘misery line’. It is not until the last few years that the service now appears to be as good as the romantic days of steam! I remember that tragedy and knew glamorous Jean Pattle well, didn’t she also have a sister? I lived at 8 Powell Road and I believe Jean lived at the top of King Edward Road, round the corner to my mate Micky Marshall. I was best man at his wedding, sadly now gone. Editor: Jean had two younger sisters – Patricia and Linda. It is so nice to read more about Laindon Station and where I went to indulge in seeing those lovely steam loco’s when Standard 4 Tanks – 2-6-4’s - were used. There is sadly, only the one 4-4-0 known as a Tilbury Tanks and that is Thundersley, and can be seen at Bressingham Gardens Museum, near Diss here in Norfolk. Years ago, I had pleasure in actually standing on the footplate. Regarding John Bathurst’s submission of 26/05/13. Strange! I can picture exactly the W.H.Smith kiosk which faced the entry to platforms 1 and 2 and shared a wall with the waiting room. For the life of me I cannot picture the location of the J.Finlay kiosk. Up until WW1 the largest seller of tobacco products on railway stations was Salmon and Gluckstein. They then began a steep slide but as late as the 1950’s I remember one of their kiosks on Liverpool Street station. It the latter half of the nineteenth century Salmon and Gluckstein decided to venture into the growing business of food catering at the many exhibitions that were then the rage. Not wishing to lend their names to what was then regarded as a down market enterprise, Salmon and Gluckstein hired a distant relative and created a separate business under his name. That relative was Joseph Lyons and from the catering business sprang Lyons Corner Houses, the Trocadero, and the many retail foods under Lyons name. Tea, coffee, ice cream, breakfast cereal, cakes, pies, pastries and various other foods. In the 1980’s Tetley, for whom I worked for 45 years and who are now the largest tea company in the UK, was part of the Lyons empire. Margaret Thatcher also worked for Lyons as a chemist in the QC department at Cadby Hall prior to her entry into politics. Lyons (and indeed Salmon and Gluckstein) are but a shell of their former selves. The products that survive have been sold off in various directions either to more dynamic competitors or to private equity organizations. Therein lies a note of caution for today’s high and mighty. As the Greeks might say beware hubris! In addition to the newspaper kiosk on the island platform (1&2) there was a tobacco kiosk belong to the Finlay Co. who had similar outlets on many other UK stations. 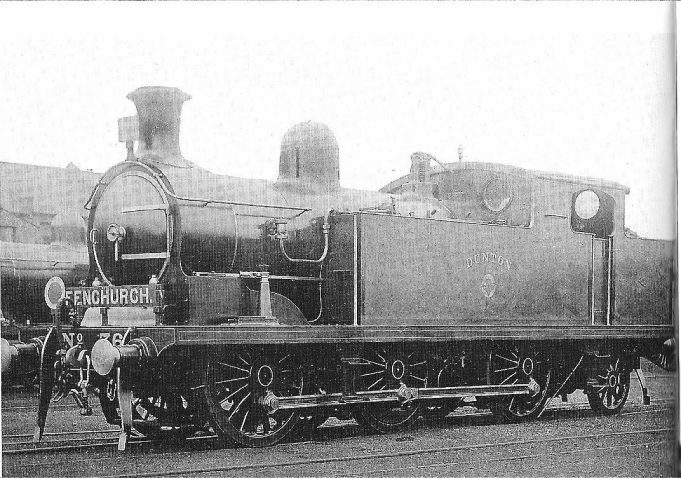 Ken in his article remarks that Laindon in common with other stations had a locomotive named after them. I find it strange there was a loco named Canvey Island which has never had a railway. Great to see that Laindon loco! My dad, Bill Wicking worked on 2nd platform for W H Smith, early in mornings. 1950s. He knew stationmaster, Mr. Sims. My job (hols) was on floor of kiosk to pick up pennies from heaven from customers who threw their paper monies at counter & overshot their coins! In a dash for their departing trains!! My dad’s boss was Mr Timms at Upminster who started at 0230hrs every morning and became blind. Roger Wicking’s passing mention of the W.H.Smith kiosk on Laindon railway station in the early 1950s evoked a distant memory. Nowadays of course demonstrations against almost anything are common. Whether it is the occupy movements or the save the singing hedgehogs crusade, every constituency feels the right to speak out. Loudly! It was not so in the early 50s. Then we all knew our place and pretty well kept to it. At least if one wished to retain a job. The extent of my rebelling was to sit in the morning train to Fenchurch Street with all the bowler hatted businessmen and their Daily Telegraphs and to open my Daily Worker purchased at W.H. 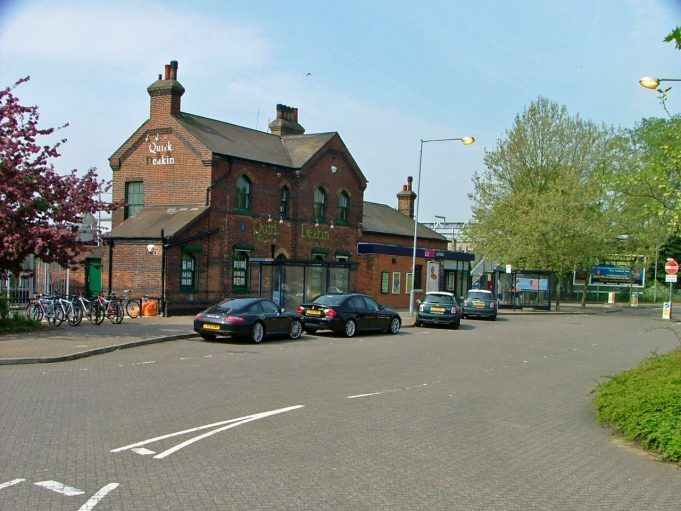 Smith on Laindon station. Not that I had communist sympathies. I simply enjoyed the shocked glances emanating from the bowler hatted crowd. What a docile era in many ways. But not all bad. Not at all. When I first started work in Fenchurch Street 1958 we used to go in the station through the canopied door on the left of the top picture walk over the bridge to platform 3 for the London train. The London end of the platform used to be so crowded because the exit at Fenchurch Street was the engine end and we didn’t want the long walk when we got off the train. Coming home we used to get on the tail of the train because station exit was at the rear, we would exit from the gate on the right of the picture, a guard always stood there to check our tickets. My season ticket when I first started was 12s 6d old money about 62p I think in todays. I was only 15 when I first went to work in London but so were many of my friends we loved our journey up the line. I was in the train crash in 1958 at Dagenham. I worked in Fenchurch Street and was only sixteen years old. It was a very foggy night and the trains were all running late. I would have got the 6.35 but as the 6.20 was still on the platform I run to catch it hoping to get home early. This was a fateful mistake as I got in the end carriage the ladies only which took the blunt of the impact. There were a lot of people lost their lives around me that night. My injuries were very serious my back was broken, my life changed for ever that night. Jean has been kind enough to provide us with more on that tragic day at Dagenham when her life was changed for ever. We all went for the back carriages as Laindon station exit is at the rear of the trains coming from London. I worked in Fenchurch St when I first left school, the old steam trains used to be packed, it used to take us ages to get to London I think we got the 7 o’clock train to get to work at 9. We used to play cards on the journey for matchsticks the train would stop at all the stations on the way up. I will never forget the wonderful smell of steam and smoke and the noise as we rumbled into Fenchurch St station. The trains were often late due to London smog but we never seemed to care to much then. Brian may not know this but just across the road from where he was born in Tyler Avenue in the bungalow named “Heronbrook” lived Sydney (“Sid”) Cordery who joined the railway at Laindon as a clerk in 1912. He was initially in the Goods Yard office, which was a small adjunct to the Goods Shed. He was there from the very time that all the material that was going to be used to create a brand new road from Romford to Southend-on-Sea began to arrive in wagons for transfer by road along Laindon High Road to the site where it was needed. This was of course, the road we all know and love as the “A127”, although, officially, it was really known as the Southend Arterial Road when it was first opened. (Don’t argue with me! It was once loved by many Laindon people who on fine Summer weekends or Bank holidays would take their deckchairs and picnic tables to sit on the verges and entertain themselves watching the cars, charabancs and cyclists stream past. Free entertainment!) Later Sid Cordery was “promoted” to the passenger side of the railway by then part of the LMS. He continued to serve tickets to passengers all through WW2 a job that involves a lot more than just that because any Booking Clerk worth his or her salt had to be something of a walking encyclopaedia about the railways and its business. He was also a rare bird among Booking Clerks; he always aimed to be as polite as possible to everybody since the breed is notoriously short-tempered. He also served during the War as ARP Warden, firewatcher and Special Police Constable. After serving tickets all through the war, Sid moved his location to Fenchurch Street where he took on the role of Traffic Controller with the job of overseeing the running of all the trains (freight and passenger) on the T&H Line (Tottenham and Hampstead) as far as Barking, as well as being responsible for liasing with the London Transport Executive for the running of the District Line trains between Bromley-by Bow and Upminster, a responsibility that was not given up until after Sid had retired.When Sid did retire it was well after over half a century of railway service. Sid was always a generous bloke who knew practically everybody who had any responsibility for running the trains through Laindon. When I was a child in the 1950s, if ever Mum and Dad couldn’t find me in the garden or our road, the first place they would check was Laindon Station, because of my love for railways. I have a copy of Joan Sims book ‘High Spirits’ and read it cover to cover twice. I have a dislike for the current look, but then that’s progress for us.